HBO’s critically acclaimed Game of Thrones® television series has introduced millions to the world of Westeros, where summers span decades and winters can last a lifetime. Based on George R.R. Martin’s beloved fantasy novels A Song of Ice and Fire,Game of Thrones chronicles the epic struggles between the Great Houses of Westeros as they vie for control of the Iron Throne. Now fans of the show can give new life to their favorite characters and schemes. Fantasy Flight Games is proud to announce the upcoming release of Game of Thrones: The Card Game, a two-player card game of intrigue, betrayals, and battles. From the scheming south and the savage eastern lands, to the frozen north and the ancient Wall that protects the realm from the darkness beyond, two powerful families engage in a deadly cat-and-mouse game for control of the Seven Kingdoms of Westeros. 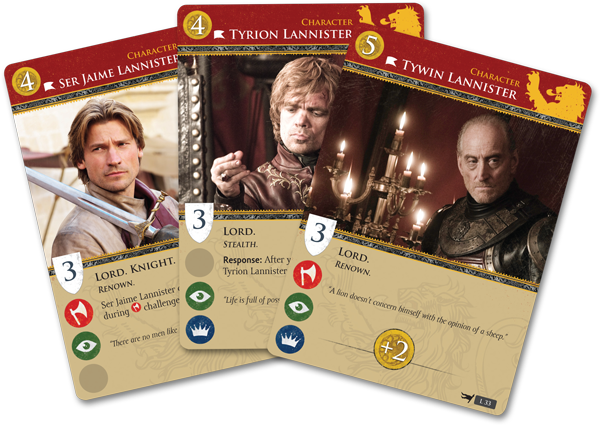 Game of Thrones: The Card Game lets two players choose their house and experience their own battles between House Stark and House Lannister. Eddard Stark fought alongside his friend Robert Baratheon to overthrow Aerys Targaryen, The Mad King, from the Iron Throne. After the war, Eddard returned to the North, to rule in Winterfell as the Warden of the North. The Stark sigil is a grey direwolf on an ice-white field, and their House words are Winter is Coming. The Lannisters are the wealthiest family in Westeros. When The Mad King was deposed and Robert Baratheon took the Iron Throne, he married Cersei Lannister. As Robert relies more and more upon the counsel of his friend, Eddard Stark, Cersei and the Lannisters take steps to ensure that they will keep the power they have earned. Their sigil is a golden lion upon a crimson field, and their words are Hear Me Roar! As betrayal, lust, intrigue, and supernatural forces shake the four corners of the Kingdoms, the bloody struggle for the Iron Throne will have unforeseen and far-reaching consequences. Game of Thrones follows kings, queens, knights, renegades, liars, thieves, and noblemen as they play a deadly game for power. Game of Thrones presents two fixed decks of fifty cards each, one for House Stark and one for House Lannister. 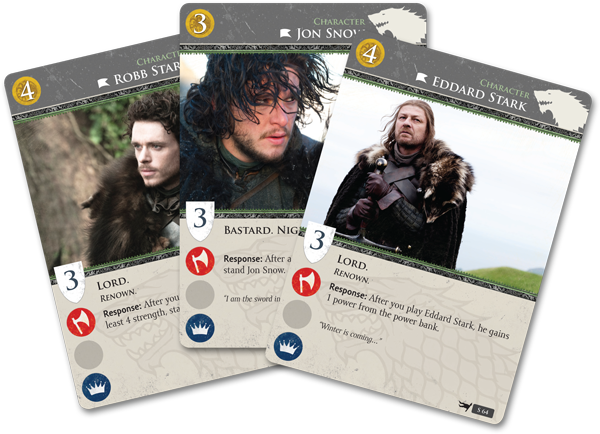 Each deck includes many of the show’s most recognizable characters and locations, including Eddard Stark, Cersei Lannister, Robert Baratheon, Littlefinger, and Jon Snow, among others. Military: These challenges represent the fierce battles taking place across the war-torn realm. Unless he wins the challenge, the defending player must choose and kill a number of his characters in play equal to the claim value on the attacking player’s revealed plot (these do not have to be characters who participated in the challenge). Intrigue: These challenges evoke the subtle and secretive betrayals rampant at court. Unless he wins the challenge, the defending player must discard, at random, a number of cards from his hand equal to the claim value on the attacking player’s revealed plot. Power: Finally, these challenges represent the overt political maneuvering and dealmaking that can so often lead to influence. Unless he wins the challenge, the defending player must move a number of power counters from his House banner to the attacking player’s House banner equal to the claim value on the attacking player’s revealed plot. As players win challenges, they claim power for their House. The first player to gain fifteen power has cemented his control over the Iron Throne, winning the game! 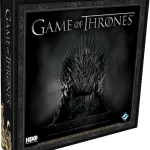 With its evocative imagery and rich gameplay, Game of Thrones: The Card Game captures the lush and vibrant imagery of HBO’sGame of Thrones in a format that makes a perfect two-player introduction to the world of Westeros. How does this release relate to the Living Card Game version?In short, it doesn’t. Cards from this product are not in any way compatible with those of the Living Card Game, nor are they legal for tournament play. 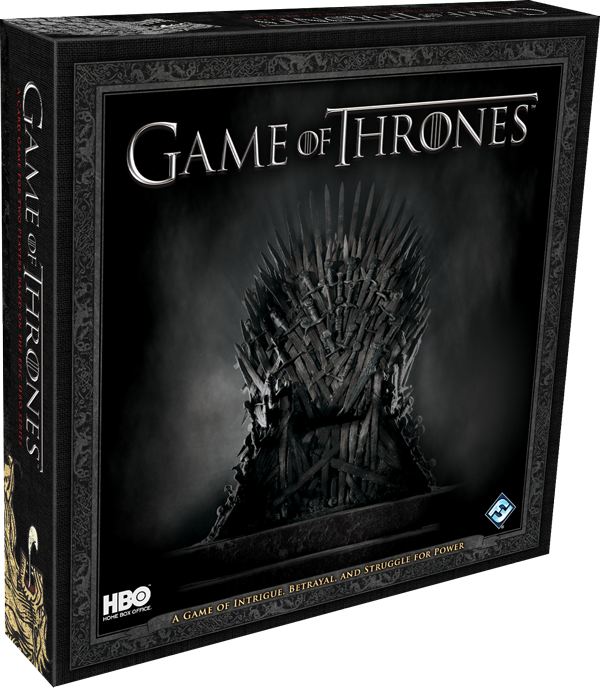 This is a simplified, streamlined version of the LCG intended for fans of the HBO series. Visit our description page for more. It features photographs and artwork from the television series. Furthermore, Game of Thrones makes the intrigues of Westeros immediately accessible with streamlined rules and fixed decks of fifty cards each for House Stark and House Lannister. The whole experience is meant to help players dive into the game’s plots and battles as quickly as possible. Meanwhile, Game of Thrones: The Card Game builds upon the its fixed decks by offering tremendous potential for strategy and replay with its unique rules for plot drafting. By pursuing new schemes each game, players retain a vital element of surprise. Look for Game of Thrones: The Card Game to arrive at retailers everywhere by the fourth quarter of 2012! [cc_blockquote_left]“Frost, it makes the blade stick.” [/cc_blockquote_left] You know what else frost does? It makes for an awesome environment in gaming! When I think of my favorite adventures, an overwhelming portion of them have a segment where the protagonist(s) are somewhere cold. For me, snow and ice, or the whole “winter setting piece,” automatically enhance any roleplaying game. Honestly, I really think the reason for this is my love for the epic, Beowulf, and Norse lore in general. By “Norse lore”, I mean VIKINGS. Everyone knows about vikings, but very few people know that aligning your mindset with that of the “Warriors of the Frozen North” is an integral step in the pursuit of happiness. There was no such thing as a depressed viking! “The Crystal Shard”, by R.A. Salvatore, takes its readers through the frigid tundra of Icewind Dale. The Dale’s harsh climate is as treacherous as it is desolate, so it houses only the toughest and most resilient creatures in the world. Salvatore does a wonderful job of providing background stories for each of the races that coexist in Icewind Dale, which sets the stage for the ultimate war between those races when the incentive to keep peace is lost. I believe that the battles fought on the frozen plains stick with the reader better than those in a forest, for instance, because the freezing environment is constantly and indiscriminately bearing down on all parties involved. The temperature is a poignant reminder for the Barbarians, Dwarves, Humans, Orcs, and Trolls involved in this conflict that victory does not necessarily mean survival. I think the level of the environment’s involvement in the story is very cool, and I also think that this can be achieved best through the use of a snowy environment like that of Icewind Dale. 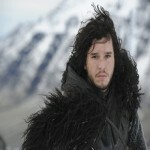 The Game of Thrones books/television series is another great example of why the snow and cold is great in storytelling. 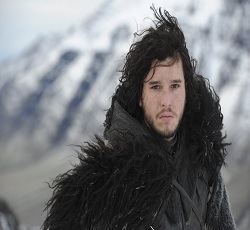 The entire series is based around the ominous and cryptic phrase, “Winter is coming.” The people in this world enjoy summers for several years (sometimes decades) and suffer through particularly long and harsh winters. The threat of another winter is always looming in all of their minds, and almost solidifies the futility of the nonstop conflict over the Iron Throne. The real priorities will start to emerge when everyone is freezing their tails off! So really, who doesn’t like a “snow level” in their games every now and again? I think snow and ice provide the most visually enticing environments to a player in nearly every conceivable scenario. [cc_full_width_col background_color="141314" shadow_color="000000" border_color="0a678f" radius="6"]There are many forms of nerds in the world. Different geeks have different streaks, and we tend to run in packs. There’s the Sci-fi crowd, setting their phasers and channelling the force when not hunting replicants or bringing glory to the God Emperor of Man. And then, there’s the Fantasy crowd who spend their nights slaying dragons, fending off the nefarious forces of Mordor, or conquering the land of Westeros. There are even more types and sorts, but at bottom there is something integral to us all. That something is how we interpret and organize our data of choice. What separates a true nerd or geek from someone who is simply enthusiastic about something is how they organize the data. For example, I am an enthusiast of flight. I love planes of all shapes and sorts because to me they are a true symbol of man’s ambition. We cannot live in the sky, there is no food or resources… even the water there is in a form that we cannot easily make use of. But the allure of flight is one that I enjoy. I will not, however, claim to be an expert of aerospace engineering. I may know a thing or two about physics and the basics of aerodynamics, but I doubt Boeing is looking for someone of my qualifications. I am enthusiastic about flight, but I am not an expert, and expertise is where gaming can truly shine. There are other bloggers and contributors to this fine website who I can vouch for being exceedingly knowledgeable in the fictional histories of their choice. The Lord of the Rings, Star Trek, Star Wars, Marvel, DC, Fire Fly… these are mythologies in the truest sense. We tell stories of the Batman and Joker, Elim Garak, and The Doctor and the Daleks as if they were tales of Zeus and Hades or Thor and Loki (well we tell stories about them as well). But we do not simply tell stories, we also nurture and craft the setting in which they are told. The amassed history of some of the settings in which some of our games take place is as lush and varied as that of real world civilizations. But what makes a history? Certainly, the major events must be recorded, hewn into the stone of our minds with great care and precision. All the dates, the details, who were the heroes? Who were the villains? This deep set memorization is quintessential to being a “proper” nerd. But a civilization is much more than just a history, and there are some details which are often overlooked, even by some of the most learned members of our community. Lets talk about Fashion, come now… it’ll be Fabulous. A lot of people have a lot of different opinions about The Phantom Menace. I won’t go into those here. 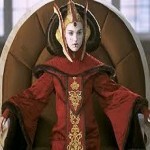 But one thing that many overlook is the costumes of Queen Amidala. In her portrayal of the Queen, Natalie Portman wears some of the most spectacular and over the top outfits to be featured in the franchise. They feature lustrous silks, intricate beadwork and embroidery, feathers and furs. They speak of opulence and wealth, but it’s the smaller details that say the most about the character. I’m paraphrasing, but, the point is that a Sari is a garment for someone who does not work. The same can be said of nearly every one of Queen Amidala’s gowns. The long and full sleeves, the full train, the beads… these are not the sort of things that you would find in the outfit of someone who works. Tabletop roleplaying games are amazing things. But, where they can break down, is when the categorization and classification that is required when amassing the information of the setting and the narrative do not have a visual component. As a Dungeon Master, Game Master, or Keeper, it is someone’s duty to be able to describe what’s going on. Not just the gore and magic, but the characters themselves. Even players could take heed, after all, they are the ones that dress their characters. I hope you found this first commentary thought provoking. In the weeks to come, I intend to expand on some of the points outlined here. The contrast of functional and non-function outfits, the usage of different materials, concepts of uniforms, and some of the historical aspects of each.